In New Jersey, Deaths At The Hands Of Police May Face Outside Scrutiny Criminal justice advocates in New Jersey want the governor to sign a bill that requires the state attorney general's office to investigate police killings. But the attorney general opposes the bill. 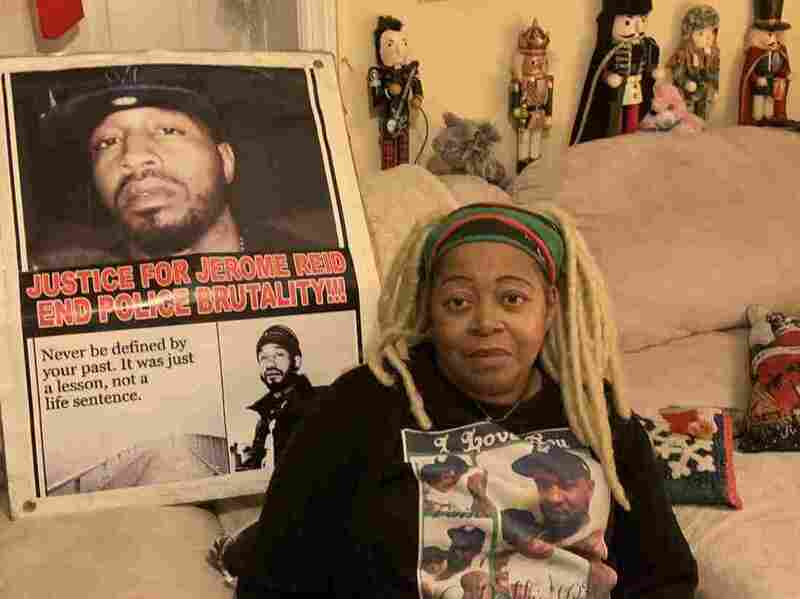 Sheila Reid, whose son Jerame was shot and killed by police in 2014, urged Gov. Phil Murphy to sign a bill requiring the state to investigate all police-involved deaths. When someone dies at the hands of police, can local prosecutors be trusted to investigate the cops? Some criminal justice advocates in New Jersey say no. They want police violence to be scrutinized by outside investigators they believe are fairer and more impartial than county prosecutors who may be cozy with local police departments. A bill recently passed by the New Jersey state legislature would require the Attorney General's office to investigate any death at the hands of police or that occurred in the custody of law enforcement, such as inside a jail. This bill may, in the end, undermine public trust in law enforcement. Yet the man who would be taking over these investigations in New Jersey — state Attorney General Gurbir Grewal — believes the legislation is a bad idea. "This bill may, in the end, undermine public trust in law enforcement," he said in a hearing before a state Assembly committee earlier this month. Grewal has been a supporter of police accountability. In 2018 he issued a directive requiring police officers to be drug tested and another saying police body and dash camera video would be released more quickly after deadly incidents. But Grewal also pointed to an existing directive that forces county prosecutors to check if they have a conflict and inform state officials before they investigate local police officers. He added that forcing local prosecutors off cases and sending in state officials would slow down investigations and anger the public. "The most frequent inquiries we already receive from the public concerning these investigations is 'Why is it taking so long?' or 'When will you release additional information?'" he testified. The state's largest police union also opposes the bill. "The message that this bill is sending is that we can't be trusted, and that some higher entity in Trenton can do a better job," said Rob Nixon, director of government affairs for the New Jersey State Policemen's Benevolent Association. "I think the county prosecutors offices are professional and well capable of doing this." A spokesperson for Democratic Gov. Phil Murphy said he does not comment on pending legislation. In coming weeks, however, the governor will have to decide whether to side with fellow Democrats in the state legislature, who passed the bill, or his own hand-picked attorney general, who opposes it. Sheila Reid is one of the people who hopes Murphy signs the bill. In the early morning hours of New Year's Eve 2014, Reid was woken up by her son, who told her that another one of her sons, Jerame, had been shot and killed. "I thought he was just BS'ing and Jerame was standing outside," Reid said. "But he said, 'No, he's really gone.' He said the police shot him." Jerame Reid had been the passenger in a car that was pulled over hours earlier for running a stop sign in Bridgeton, N.J.
Police found a gun in the car and drew their weapons. Then Jerame Reid, disobeying police orders, began to get out of the car with his hands up. Officer Braheme Days shot Reid in the chest and arm, killing him. Cumberland County Prosecutor Jennifer Webb-McRae personally knew Police Officer Days, so she recused herself from the case. But Reid and others felt like the office still did not conduct a thorough investigation into Jerame Reid's death. Eight months after the deadly shooting, a New Jersey grand jury decided not to charge Days and another police officer involved. "Not only did the grand jury do me and my family wrong," she said, "they did everybody wrong, because once one police officer gets away with murder, they all do." Walter Hudson, a social justice activist with the New Jersey-based National Awareness Alliance, suggested that even professional relationships between prosecutors and police can cause conflicts of interest in use of force investigations. "How can we expect a fox to investigate another fox over a chicken killing?" he said. Some states, facing calls for increased policy accountability in an era of growing national interest in criminal justice issues, have taken steps to shore up the firewall between investigators and cops. Hawaii recently created a review board inside the state attorney general's office to investigate deaths involving police officers. New York requires state officials to conduct an investigation when police kill an unarmed civilian. But Sheila Reid said there won't be any justice for families like hers until New Jersey and other states put similar protections in place. "The way it's going now, we're not gonna have a standing chance," she said. "The police are gonna kill us one way or the other and they're gonna get away with murder."